Your color, your flavor, your texture, your nutrients. The way your edges get crisp and your centers remain tender. The way you complement spicy flavors so well. The way you pair with Mexican food like besties. The way you’re always there for me when I’m starving but feeling so very lazy. Today, I’m adding one more way to love sweet potatoes. Hope you don’t mind. Wedges may be one of my favorite ways to eat potatoes. When I was a kid, a lot of fast food restaurants served potato wedges and, besides curly or waffle (obviously), wedges were where it was at. The edges get all crispy and browned and the centers remain soft and tender. And with the addition of a little salt, you get that perfect mix of savory and sweet – a contrast I adore. Another perk of this preparation style? Just 30 minutes start to finish and the whole recipe (including sauce) requires just 7 ingredients! The only thing missing from straight up fries is a dipping sauce. There must always be a dipping sauce. There’s something delicious about honey mustard sauce and despite many attempts, I’ve never able to recreate it at home to the quality and flavor I wanted. That is, until now! A base of cashew butter makes a neutral, creamy base and lets the flavor of the mustard punch through. And in place of honey, I opted for maple syrup as a natural sweetener. The result was perfect. Friends, I think this may be love. 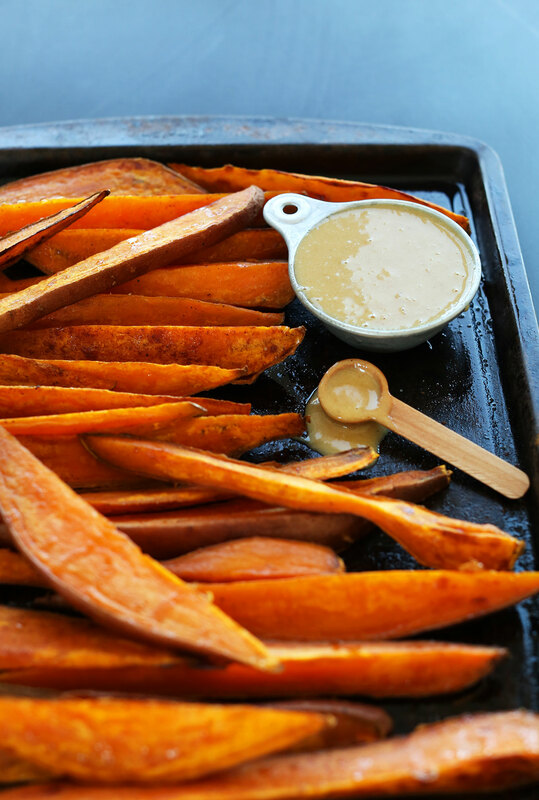 30-minute roasted sweet potato wedges with creamy "no-honey" mustard dipping sauce! Savory, sweet, and so healthy and delicious. Preheat oven to 400 degrees F (204 C) and grease a baking sheet. Toss sweet potatoes in oil until all sides are well coated. Season with salt and pepper and toss once more, then arrange in a single layer on the baking sheet (if crowded or increasing batch size, use two or more baking sheets). A total newbie here – what do you grease the baking sheet with? And thanks for the recipe! Sweet potatoes do not get enough love. We’re glad you enjoyed it, Maya! Sunflower butter and yellow mustard instead of what the recipe calls for but this is literally the best “honey” mustard I’ve ever had!! From some gf, vegan, AND low fodmap—THANK YOU! This is my first review ever for a recipe! These baked sweet potato fries are just excellent! I’ve made them many times as a complement to a meal… or as the meal itself! Fantastic! I made the dipping sauce with tahini and used water to thin it as needed. Wonderful! If I only have Dijon mustard then what can I add to make it taste similar? I used coconut butter and it tasted great! Thank you. I had roasted a cubed sweet potato in olive oil, salt and pepper and realized I needed a dipping sauce in the last 5 minutes of cooking time. I searched “vegan dipping sauce for roasted sweet potato” and I got this site as a result. I made the “honey” mustard dressing using tahini, grey poupon, maple syrup, etc. It was perfect for the potatoes. Thank you for that! I made this honey mustard for a party and it was a big hit! I originally doubled the recipe and still had to make a second batch because it went so quickly. I used tahini since I couldn’t find cashew butter, and it was creamy and fantastic. I couldn’t get my sweet potato wedges to crisp up, but it didn’t really matter because the sauce was so good. Absolutely scrumptious! Made this for a party and everyone raved. Thanks! I am looking forward to trying more of your recipes. I’m not on a plant based diet or anything but I do love your recipes! I just tweak it a bit to suit my own needs. For this recipe instead of cashew butter can I use my all natural peanut butter? Or would it be too over powering? It would be too overpowering, sorry! I love sweet potato and in India you will see vendors at every nook and cranny with a spicy and tangy sweet potato treat. Yours with this awfully delicious looking dip looks amazing! Just ran across this recipe since we will be harvesting sweet potatoes from our yard in Southern Utah in another 6 weeks or so–last year we had over 300 lbs. so I figure I better start now gathering sweet potato recipes! This looks mahhhvalous, dahhling! I’ve done the wedges lots of times, but the maple-honey sauce is an inspired addition. Thanks for your plant-based recipes! This would be a great after school snack for my kiddos. They are all about the dip! Thanks! Can I use peanut butter instead of cashew butter? I have very limited cupboard space, and can’t store something I won’t use hugely often (at least, not compared to peanut butter). Or something else maybe? Help a cooking newbie out please! Yes! It just will taste quite a bit different. Otherwise, go with tahini! So great! Thanks for sharing, Allison! 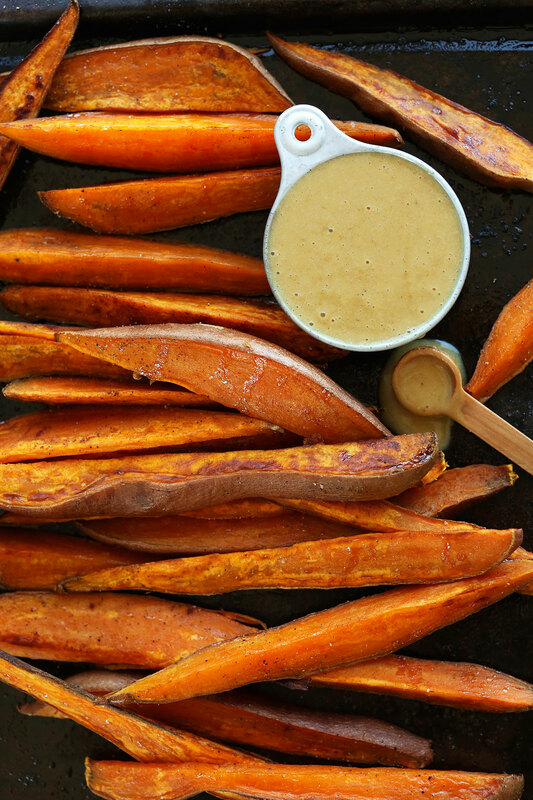 Oh, I could eat sweet potatoes EVERY day – and your recipe looks yummy. Such a good idea, making a sauce with cashewbutter, nomnom. Gotta try it! I did’nt knew that the peel is eatable. Sweet potatoes are not very common here in Denmark, and quite expensive too. I really like your blog, by the way. Very inspiring, and easy recipes. honestly, i was thinking of frying up some sweet potato chips the other day, and for some reason i couldn’t find sweet potatoes anywhere in town, not even at Whole Foods. These look fantastic, using cashew butter in the mustard sauce is a genius idea!!! I came to check out your blog (as usual) and the first recipe I see are these sweet potato fries, while I was eating sweet potato fries!!! Coincidence?!? Thanks Anne! I hope to visit Australia someday! It sounds and looks lovely. Well I just happened to have some sweet potatoes roasting in the oven for a salad topping when this post came in my email! I had no clue what I was going to use as a dressing so this no honey mustard dipping sauce became my dressing! Let me just say you really nailed the “honey mustard” flavor with this one. I didn’t have cashew butter on hand so I just ground some cashews up but it was so yummy I was literally eating spoonfuls of it (bad girl)! This dipping sauce is definitely going into my normal salad dressing rotation! Thanks Nicole! So glad you enjoyed it! So great! Thanks for sharing, Nicole! I actually don´t like much sweet potatoes, but this way of making them looks pretty good. I know my husband and 10 year old girl will love them. I definitely will give them a try. It is a great snack option. haha, me too! If faced with a plateful of all those potato varieties, I’d have to have a handful of each! Yes, I love these! I’ve always said the key to really good sweet potato fries is a good dipping sauce! This sauce looks awesome, and I love that it’s a lil sweet, way better than honey mustard! I LOVE sweet potato wedges! I gotta try the mustard sauce! GIRL! I want these wedges and that honey mustard sauce right meow. OMG. Dinner for tomorrow sorted, these look incredible! 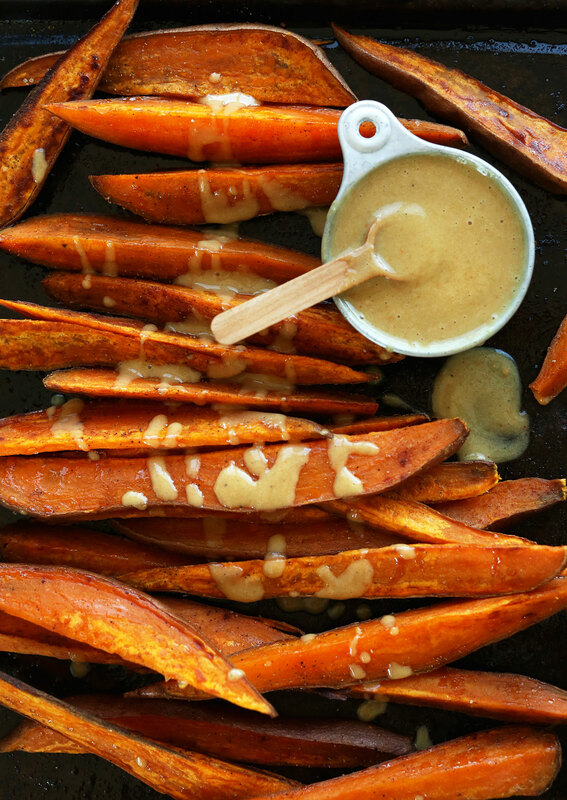 I love sweet potatoes and almost always eat them with a honey-mustard sauce! Can’t wait to try this recipe. Even though being half Irish, I hate potatoes! However, sweet potatoes are my favourite food and these wedges looks perfect. 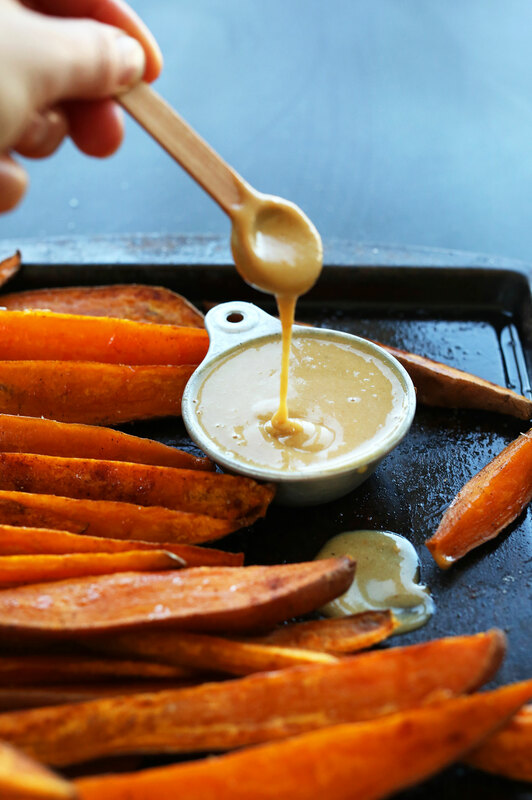 I love making sweet potato wedges as well but I never have a dipping sauce but this sauce looks amazing! Oh wow that looks absolutely amazing. 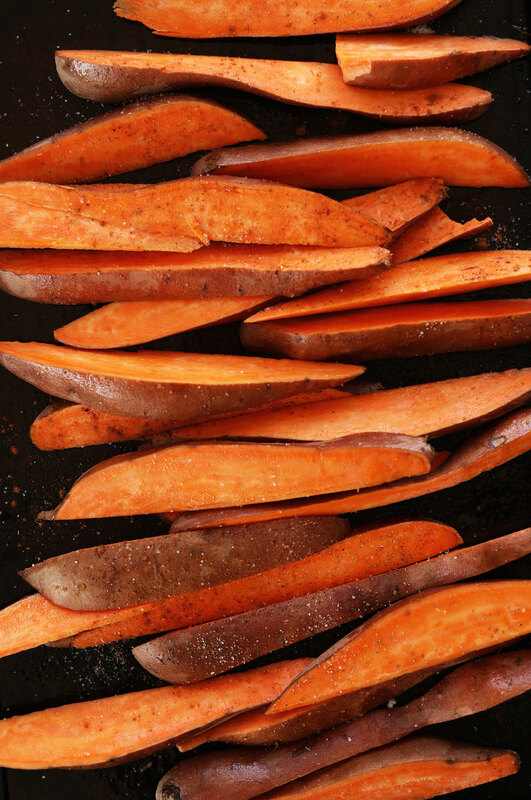 I’m seriously addicted to sweet Potatoes lately so I just have to give this recipe a try. Mostly, yes! I wouldn’t say I’m 100% strict, but rather consider my diet plant-based. Good for you!! I am vegan/gf and I would never go back. I feel great! Love your blog! It’s looks amazing, can’t wait to try it. Thanks. I totally know what I’m having for lunch.. I have a bit of a love affair with mustard, cashew butter, and maple syrup so this sauce speaks to me on so many levels. When I was younger I always went for the wedges! Definitely the best. This sounds so good! I’ve been craving sweet potato fries lately, so this is perfect! It’s a great side dish for Cinco de Mayo eats too! Oh, goodness! 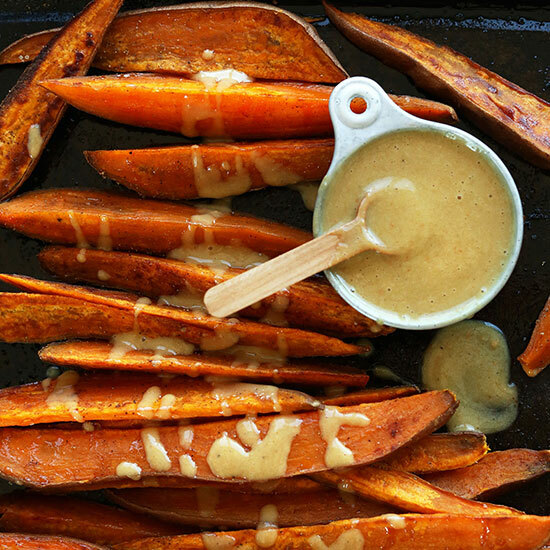 Honey mustard is my weakness…and you go and pair it with sweet potatoes?! This recipe is just fantastic! Right? Prepare to be obsessed! I love your recipe. I usually just use russet potatoes, nothing special, slice them thin and bake them in the oven. I usually like my potato fries cut a little thinner because if they are too thick, they aren’t french fries, they are potato wedges or potato logs. I’ve never heard of mustard sauce for french fries. In Utah, people eat fry sauce. I was a Southern California girl when I first moved to Utah, and I would see people drenching their french fries in this awful pink mixture of ketchup and mayo. It looked really sick so I was reluctant to try it. Overall, fry sauce is very good, and very popular here. Up until coming across this post I never knew of a thing such as a Food Stylist and I’m glad I know now. Oh sweet potatoes, how I love thee. I’m a total wedge-gal too, so I could honestly plow through this pan and call it lunch! The way this post read at the start made me lol. That sauce looks AMAZING, must try it at some point. I remember trying a honey mustard sauce once in my pre-vegan days and absolutely loving it! It makes the perfect complement to these wedges! Hope you love it!